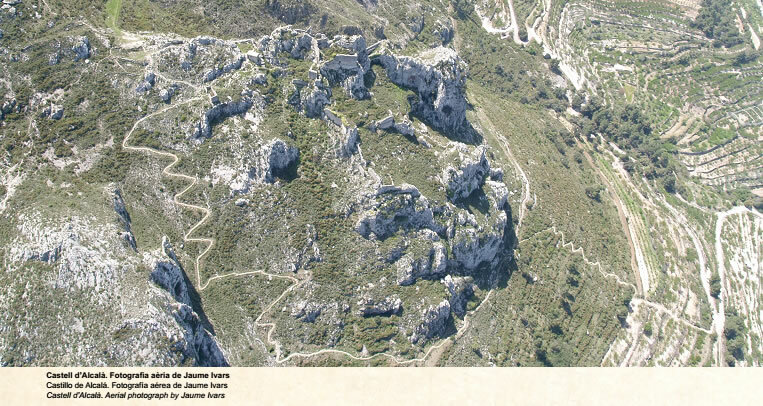 During Islamic times the Vall de Gallinera was a major route linking Denia to the territories of Cocentaina, and beyond that to Xàtiva and the frontier zone with the Christians. There are several Islamic castles, fortifications and settlements along the river valley. 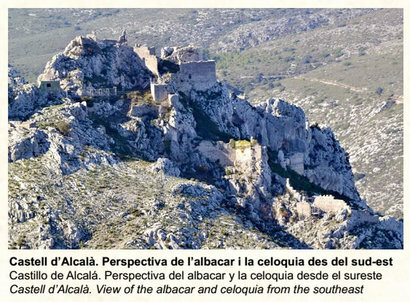 The Castell de Alcalà is known both as the Castell de Benissili - after the village which it overlooks, as well as the Castell d'Alcalà de Gallinera - the name Alcalà coming from the Arabic qalaça meaning fortress city. It is located on the south side of the head of the Vall de Gallinera on a wide, rocky promontory (780m) surrounded by cliffs. The location provides a good view of the length of the valley with glimpses of the sea in the distance. An archaeological study carried out in 1983 revealed abundant shards of pottery spanning a period of almost 500 years, from 11th / 12th century, until the 16th century when the castle was abandoned. This dates the origin of the castle to Islamic times. The construction is in an advanced state of ruin, but the layout can be seen as one typical of an Islamic fortified hisn. On the highest peaks there is a complex celoquia with a semicircular tower at one end (I), and what could be the remains of a tower at the other (O). 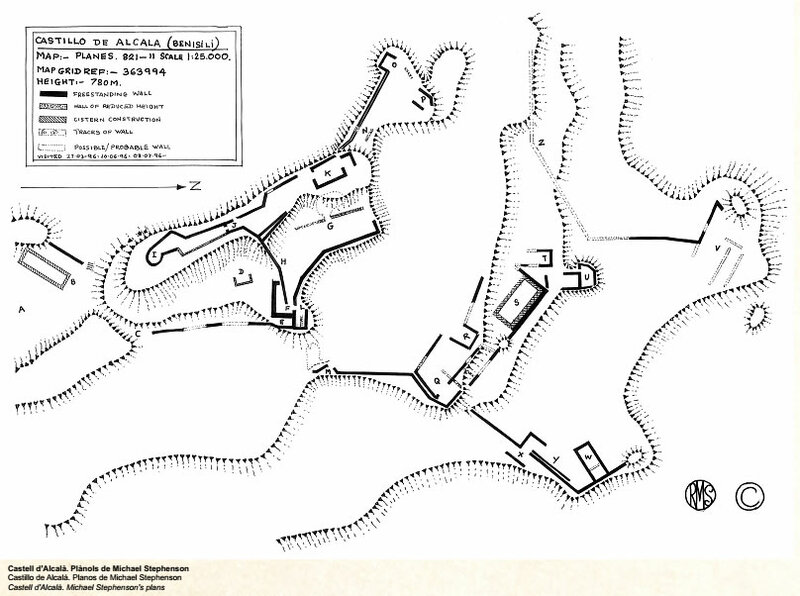 Access to this area is via a dog-leg entrance on the west flank, protected by a rectangular tower (K). 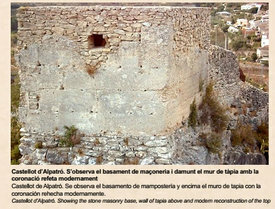 The walls and towers are of various sizes of tapia, alternating with stone masonry of the opus incertum and opus piscatum types. (see Glossary). An extensive walled enclosure (lower albacar) extends eastward on a large plateau. Its boundaries are defined by tapial walls with an offset (dog-leg) entrance (X). This area appears to harbour remains of buildings, possibly dwellings. 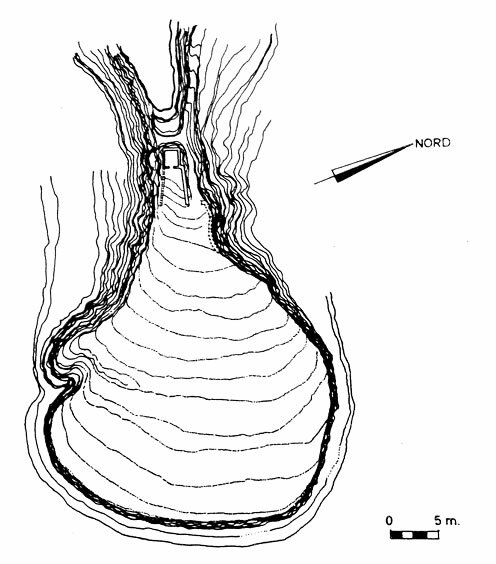 The third area (upper albacar) houses a cistern (B) and has the same features as above. 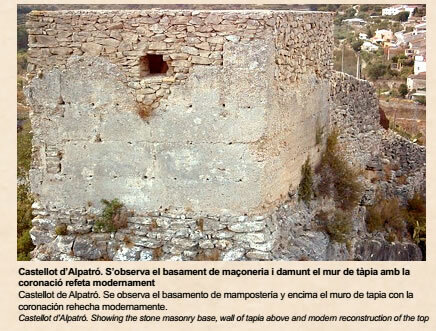 ​Recently, some of the tapial walls have been restored using the original techniques, and a similar mix of sand, rocks and mortar. The project aims also to shore up and clean crumbling walls, and in some places preserve, or re-create the silhouette of battlements to convey the defensive nature of the architecture. An example of the wooden form-work and put-logs has been left in place, so that visitors can appreciate this ancient building technology. 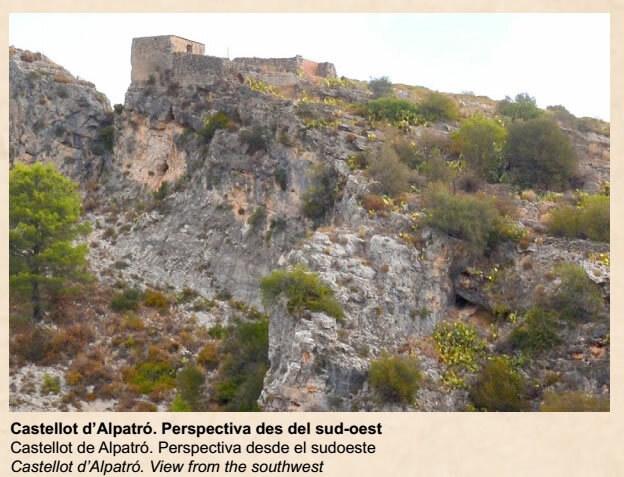 The Castellot de Alpatro consists basically of a small square tower with sides of 5.7m - 5.8m. It sits on top of an abrupt flat-topped peak, or butte, between two ravines on the northern side of the Vall de Gallinera. The tower overlooks the course of the Rio de Gallinera and the village of Alpatró beyond.